Movie posters were once a form of art and also a marketing tool. Painstakingly hand drawn on acrylic or oil canvas and then transfer to paper format, movie posters in the past were a joy to marvel at. Fast forward to present times and what you see nowadays in theaters are just awkwardly digitally created posters with embarrassing body proportions and cut-and-paste headshots. The Art of Alvin John takes readers back to the days where movie posters were created on paint and paper. The works from the talented illustrator ranges anything from Steven Spielberg’s E.T., Empire of the Sun to Jurassic Park, Ron Howard’s Cocoon, Batman Returns, Gremlins to Disney’s The Lion King, The Little Mermaid and many more. The 160 pages hardcover book written by Andrea John, the wife and studio partner of Alvin John gives her insights such as behind-the-scenes snippets and detailing the process of how those iconic posters were created by her late husband. 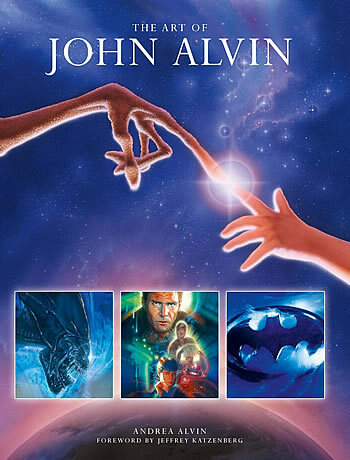 It’s a surprise to learn that Alvin actually made use of real-life models including his daughter’s hand for the poster for E.T., actual props as a guide for his layout and a visit to Stan Winston Studio for the creation of the Jurassic Park poster. The book comes with pictures of John’s original rough drafts, sketches, unpublished versions and ideas although comparatively speaking, titles such as Blade Runner, Star Wars and Jurassic Park were given more coverage than the rest. It’s a pity as well given Alvin’s extensive body of work, the book could have included more of his contributions instead of a selected few. All in all, if you love the works of Drew Struzan, you shouldn’t miss The Art of Alvin John, still a wonderfully produced art book for movie lovers despite a few flaws.